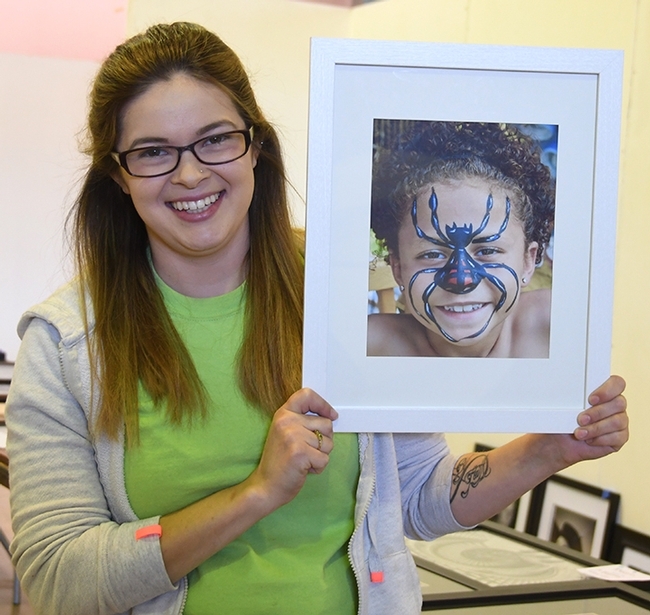 The 69th annual Solano County Fair, located at 900 Fairgrounds Drive, is themed "Blue Ribbon Fun"--and that includes bugs. 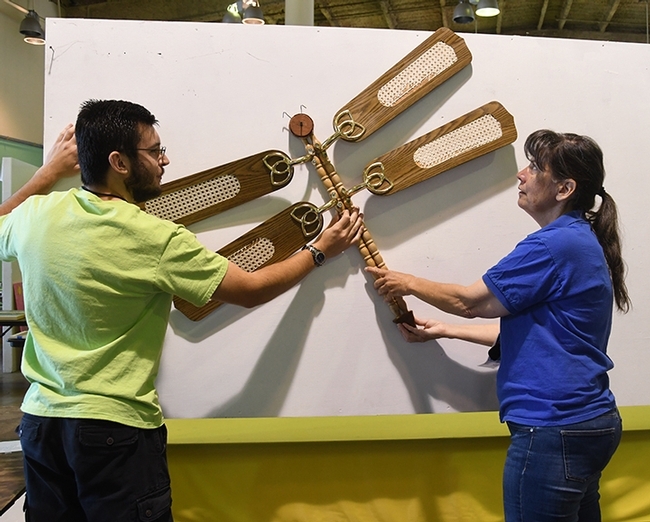 At McCormack Hall, youth and adult exhibitors are displaying such projects as an insect-themed afghan, photographs of insects; a photograph of a "spider girl"; and a wall hanging of a dragonfly crafted from fan blades and furniture legs. 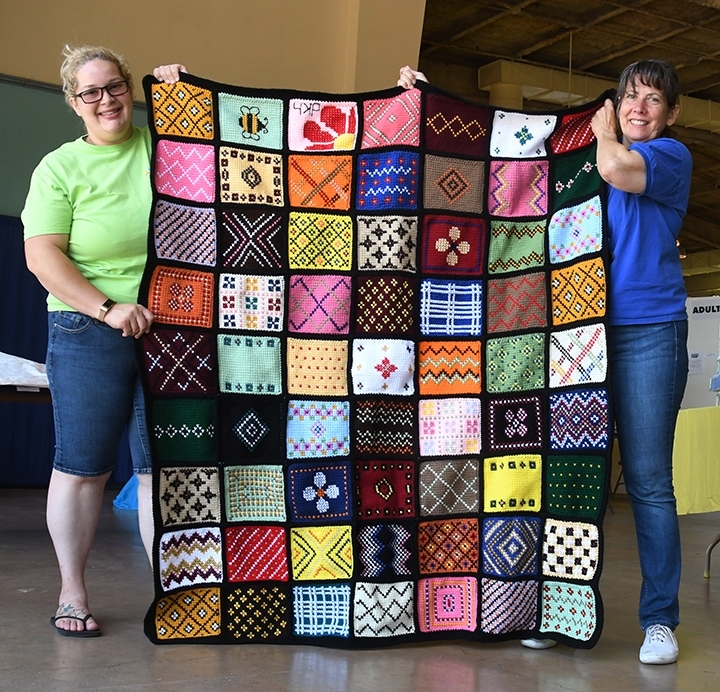 McCormack Hall superintendent Gloria Gonzalez, a community leader of the Sherwood Forest 4-H Club, Vallejo, marveled at a bumble bee and other patterns on a Minnesota sampler crocheted afghan, the work of Debra Holter of San Pablo. Gary Cullen of Vallejo entered a photo that he titled "Spider Girl," of a smiling girl with a spiderish facial costume. Ryan Anenson of the Tremont 4-H Club, Dixon, who is enrolled in a beekeeping project, submitted a close-up image of a honey bee. Maya Prunty of Sacramento 4-H submitted an image of a moth. 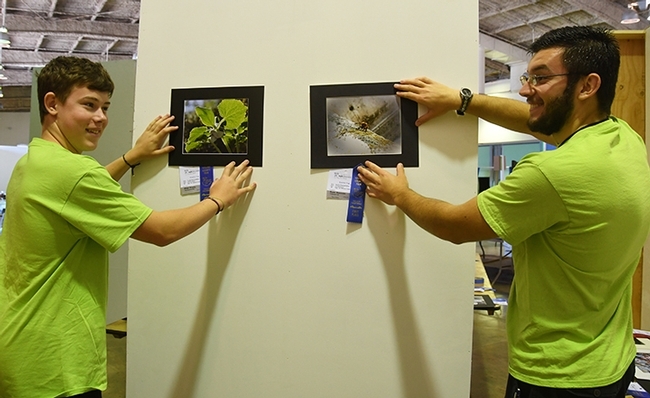 Those are just a few of the arthropod-related exhibits at the fair. Some of the items are available for purchase in the fair's Competitive Exhibits Program. The highest bidder in the silent auction takes home the exhibit. That will include the honey bee image by teenage beekeeper Ryan Anenson. It promises to be a fun and educational entomological weekend at the University of California, Davis! Think noon and night. 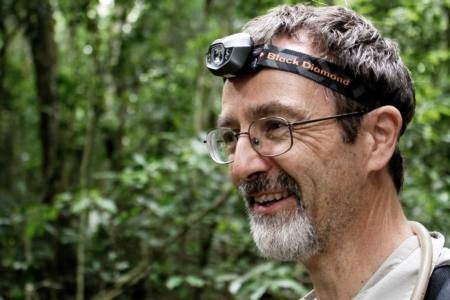 At Friday noon, July 17, ant specialist Phil Ward, professor of entomology, will present a program on the species of ants found in the Häagen-Dazs Honey Bee Haven. This will be a special brown bag session in the haven, located on Bee Biology Road, next to the Harry H. Laidlaw Jr. Honey Bee Research Facility. Images of these species can be found on the AntWeb (www.antweb.org). At least six other species of native ants reside in the vicinity of the garden, including Formica aerata, Pogonomyrmex subdentatus, and Solenopsis xyloni. The introduced Argentine ant (Linepithema humile) occurs around the Bee Biology building, but it appears not to have colonized the bee garden. 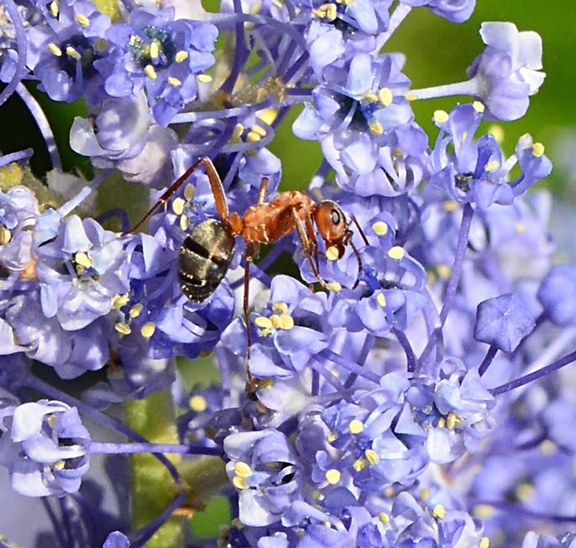 Attendees will learn how to observe and identify California native ants, and learn about the differences between bees and ants in this free event. For more information see the flier and access the haven web site. The haven is owned and operated by the UC Davis Department of Entomology and Nematology. It was planted in the fall of 2009. Christine Casey is the staff director and Extension apiculturist Elina Niño is the faculty director. Then on Saturday night, July 18, the Bohart Museum of Entomology's first-ever evening open house will take place from 8 p.m. to 11 p.m. The Bohart is located at 1124 Academic Surge on Crocker Lane. Free and open to the public, Moth Night will include outdoor collecting; viewing of the Bohart Museum's vast collection of worldwide moth specimens; demonstrations on how to spread the wings of a moth; and information on how to differentiate a moth from a butterfly. Free hot chocolate will be served. The event is in keeping with National Moth Week, July 18-26, an annual event coordinated by Friends of the East Brunswick (New Jersey) Environmental Commission. 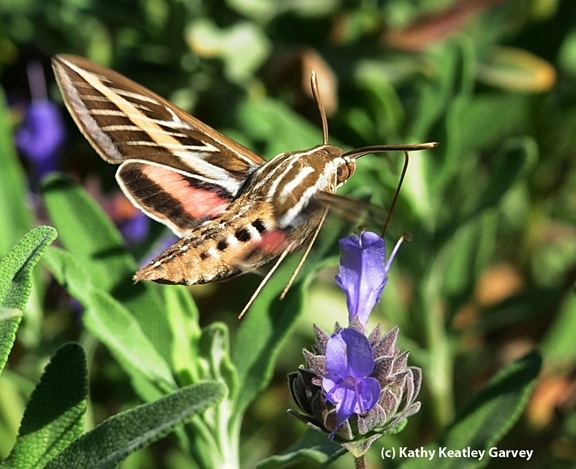 This year, National Moth Week will spotlight the Sphingidae family of moths found throughout the world commonly called hawk moths, sphinx moths and hornworms. Citizen scientists will be out in force to record and photograph what they see that week. Tabatha Yang, public education and outreach coordinator of the Bohart, said that after the sun sets, a black light demonstration will be held. Visitors will collect moths from a white sheet, much as residents do around their porch lights. Entomologist Jeff Smith of Rocklin, an associate and 27-year volunteer at the Bohart Museum, will show visitors how to spread the wings of moths. Smith curates the 400,000-specimen Lepidoptera collection at the Bohart Museum. Smith organizes and identifies the butterflies and moths, creates the drawers that display them, and the labels that identify them. In between, he shares his passion for insects and spiders at outreach programs. Since 1988, Smith has spread the wings of 200,000 butterflies and moths, or about 7000 a year. Naturalist Greg Kareofelas of Davis, a longtime associate at the Bohart Museum, will assist with the open house and the outdoor collecting. The Bohart Museum, directed by Lynn Kimsey, professor of entomology at UC Davis, is a world-renowned insect museum that houses a global collection of nearly 8 million specimens.